Clark Farm’s Youth Educational Programs aim to teach the next generation about food and farming and to foster lifelong interest in sustaining the environment. Our organic crop production is surrounded by forest, fields and wetlands, and the farm is also home to our sheep, goats, pigs, and laying hens. We currently offer programming for various grade levels of our local kindergarten, elementary, and middle school, Carlisle Public School, as well as other local student groups. 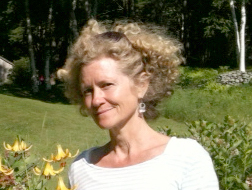 Susannah joined Clark Farm as Farm Educator in 2014. She is also a Teacher Naturalist at Mass Audubon's Drumlin Farm in Lincoln, MA, where she has taught young and old alike since 2000. After establishing a career at various museums in New York, she planted her first garden 15 years ago and shifted from interpreting art and architecture to interpreting nature. Since then, Susannah has been actively engaged in encouraging an understanding of and appreciation for the natural world and sustainable farming. Her incredible energy and ability to connect with people have made her a vital part of the Clark Farm Team as we build our educational programming. Contact our Farm Educator, Susannah Elliott, to discuss program details and pricing.